Rolling hills and valleys along the Southeast Indian Ridge, south of Perth, looking to the west. This is one of the regions used to test competing hypotheses on the formation of these ‘abyssal hills’, largely formed at water depths around 2.5 km in the ocean basins. The new study concludes that they are caused by crustal faulting, not climate cycles. A sensational hypothesis suggested that climate and sea level cycles directly drive magma generation and the rolling hills of seafloor topography. 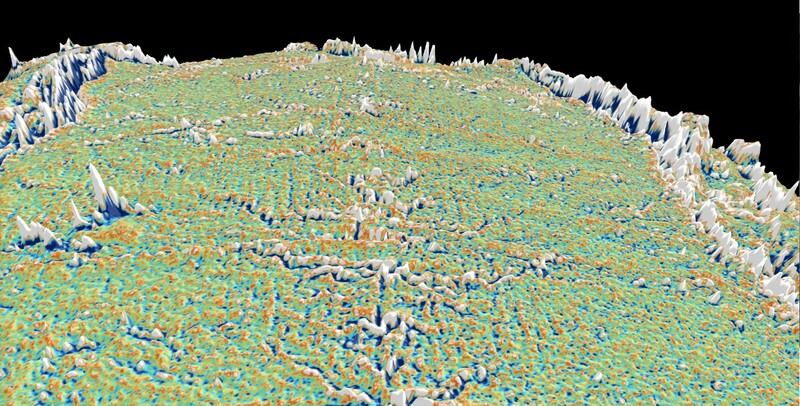 But computer models of volcanism and faulting at mid-ocean ridges lead to the view that crustal faulting forms seafloor ‘abyssal hills’. Dr Sabin Zahirovic and Professor Dietmar Müller from the University of Sydney’s School of Geosciences teamed up with Dr John Goff from the University of Texas Institute for Geophysics to use high-resolution seafloor data to test the two hypotheses. The results were published last week in the high-impact journal Geophysical Research Letters. This story goes back to two widely publicised papers in 2015 in which researchers had suggested that fluctuations in sea levels between warm periods and ice ages directly influence volcanic processes generating new ocean crust, leading to alternations in ridges and troughs on the seafloor. Geoscientists agree that the cyclicity in the shape of Earth’s orbit around the Sun drives the seasonality of solar radiation reaching the Earth’s surface. In turn, the cycles of increased or decreased solar radiation reaching the Earth directly influence the Earth’s climate system, driving the advance and retreat of ice sheets and glaciers. The provocative hypothesis published in 2015 argued that the orbital cycle signals should be recorded in the fabric of the seafloor as it formed during these cycles. Professor Müller said that if correct, the same global climate signal would be present to some extent everywhere on the seafloor, modulated by the rate at which new seafloor is being created, which reflects the speed at which tectonic plates are moving apart. “The hypothesis seemed fantastic, in that the seafloor may resemble a mirror image of climate fluctuations, and the sun would be driving the vigour of magmatism at mid-ocean ridges, where new ocean crust is being created,” Professor Müller said. Dr Goff and co-authors designed a test for the prediction that abyssal hills everywhere in the ocean will reflect a coherent climate signal as a function of crustal age. Dr Zahirovic said they selected three regions in the Pacific and Indian oceans where high-resolution topographic and crustal age data are available. “We applied an old signal processing trick, which involves ‘stacking’ or averaging a large number of profiles across mid-ocean ridges,” Dr Zahirovic said. The result was that the random nature of abyssal hill topography emerged, and no coherent climate-driven signal emerged. To view an interactive map of global abyssal hill topography and other tectonic features of the seafloor, visit a Virtual Globe (best viewed in Google Chrome), created by the EarthByte Group.